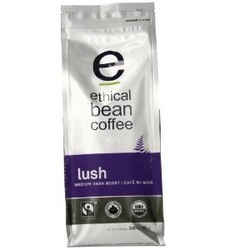 Save on Ethical Bean Lush Medium Dark Roast Coffee (6x12 OZ). Any richer, and you?d ask it for it a loan. A heavy cup with Burgundian fullness, alive with fruit, smoke, and earth notes. This decriptions is informational only. Please review the actual product for ingredients and suggested serving prior to use.